PRESSED for time, Team Pilipinas coach Yeng Guiao is just trying to make do with what he has as he makes his preparations for the sixth window of the 2019 Fiba World Cup Asian qualifiers. 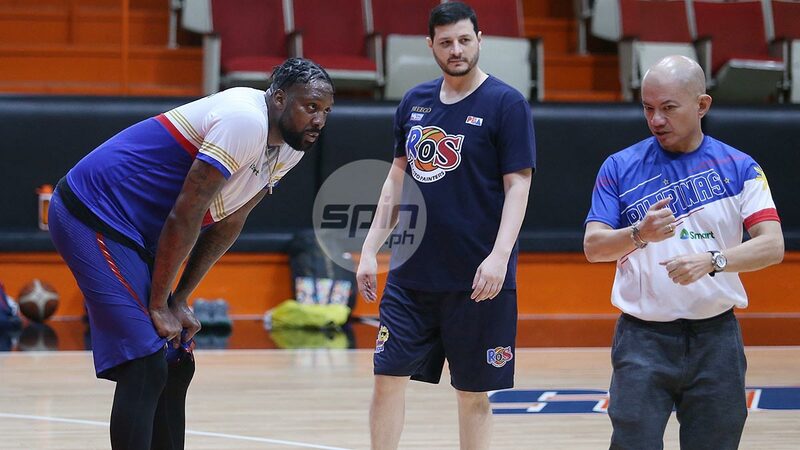 The fiery mentor is trying to squeeze every chance he gets to further familiarize Andray Blatche to the system and the pool with the naturalized player leaving for China on Monday. "Gumagawa kami ng paraaan. So on Saturday, what we’ll try to do is put together five or six guys, kahit di kami makabuo ng buong team. Gusto lang naming may at least lima para maitakbo namin yung mga plays namin maski 5-and-0 drills lang. So on Saturday and Sunday, malamang ganoon na lang ang gawin namin bago siya umalis," he said. The limited time of preparation has been an ever-present problem for the national team coaches of the past, and Guiao is no exception. "I’m always looking for time as much as I can. Siguro kahit bigyan mo ko ng isang buwan, kulang pa rin sa akin. Parati kang naghahanap ng extra time, the same way I feel na in all the windows that we played in, parang nabibitin ako sa practice time. It’s the same feeling right now, parang bitin parin ako, nakukulangan pa rin ako," he said. That problem couldn't be more obvious with the players trying to learn two different systems, that of the national team and those of their mother ballclubs which, in Guiao's eyes, leads to a number of confusion during the games. "Ang problema kasi talaga, naka-straddle sila between two systems: the mother team’s system and the national team system. Kapag ganoon ang situation, tapos kokonti yung practice time namin, that is the cause of your confusion and the cause of uncertainties in running the system," he said. Guiao, though, has learned to deal with the hand he's been dealt and thanked the PBA's gesture of holding off the games until Feb. 13, making almost all the players available for Gilas Pilipinas before it flies for Doha on Feb. 16. "We appreciate that, actually. If we can start on Monday at the 11th, we have another five extra days of practicing before we leave. Ang laking bagay na noon para sa amin," he said. "What I’ll try to do is from Monday on, we will request that we practice every day, kahit wala na si Andray. So at least yung mga locals lang natin, yung mga regular players natin, mailayo na natin nang kaunti doon sa kanilang mga sistema sa mga mother teams nila para lang maka-focus sila doon sa mga plays muna ng national team. So with or without Andray, we will try to bring together the team next week. If we can do that every day, we’ll try to do it every day."